How did this happen? Why is the justice system in South Africa funny? Shrien Dewani, the British millionaire businessman accused of arranging his wife's murder during their honeymoon in South Africa in November 2010 was today cleared of any part in the murder. The judge, Jeanette Traverso, dismissed the case against Shrien Dewani, because according to her 'the evidence presented by the prosecution fell "far below the threshold" of what a reasonable court could convict on. She said the evidence of the prosecution's main witness, taxi driver Zola Tongo, was "riddled with contradictions" and "highly debatable". Meaning sh didn't believe what he said in court. Meanwhile, there was video showing Mr Dewani meeting with Tongo and giving him money days before the murder, but this was not enough to convict him. He will now be released. 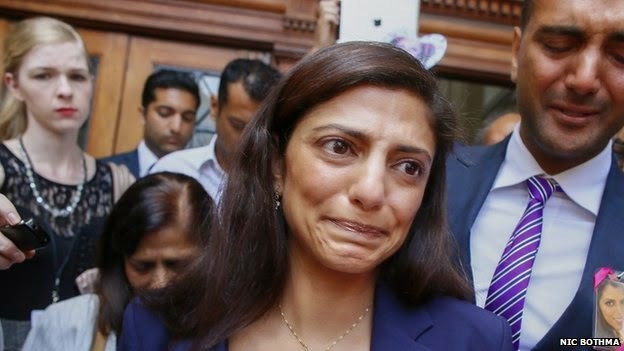 The murdered wife, Anni Dewani's family including her sister Ami, brother Anish, and father Vinod (pictured above) - broke down after the ruling, and said they couldn't believe their sister didn't get any justice. They said they would suffer 'sleepless nights for the rest of their lives'.